I have just returned from the British Health Qigong Association (BHQA) Instructor course for 2018. This year I chose to do the Mawangdui set. This is one of nine Health Qigong sets compiled by the Chinese Health Qigong Association (CHQA). This was my 5th course over recent years and as always never failed to please, stretch, stimulate and expand my knowledge and experience. I had a fabulous group of people to train and work with from as far a field as Australia. Our group was taught by Professor Zhang from Shanghai Sports University. There was loads of laughter during the sessions and excellent teaching throughout. As well as the in depth instruction for each move, I particular liked the Wednesday moning session when she delivered a talk on the history of Mawangdui followed by a presentation on the meridians for each move. The final day is for assessments – technical and teaching. Everyone has to do the technical assessment i.e. we perform the routine in small groups. Those who are new (up to two years training) also have to do a teaching assessment. This is 10 minutes delivering one move to your group. I no longer have to do that aspect but it is still nerveracking doing the technical assessment. It has got slightly better over the years. I’m glad to say that I passed the technical assessment as did all my group – great team! Once all the assessments were completed the day was rounded off with a closing ceremony to thank the Professor and those who had been judges and those who had helped out during the course in whatever way. These courses have grown over the years – this was the tenth year and it is wonderful to be part of such a quality organisation. We are a big qigong family that keeps on growing. There is always a supportive atmosphere and it is great to catch up with “old” friends and make many new friends too. Photos from the course can be viewed here. If anyone is interested in doing a BHQA course, they are held every year at the end of May (half term week). Details are on their website before the end of the year for the following year. There is also a discount if booked before the end of January. I would highly recommend these courses and Health Qigong itself. It is a great way to look after your body and mind. So I’m hoping that some of you that are reading this may at least be curious to find out more so please visit the BHQA website. 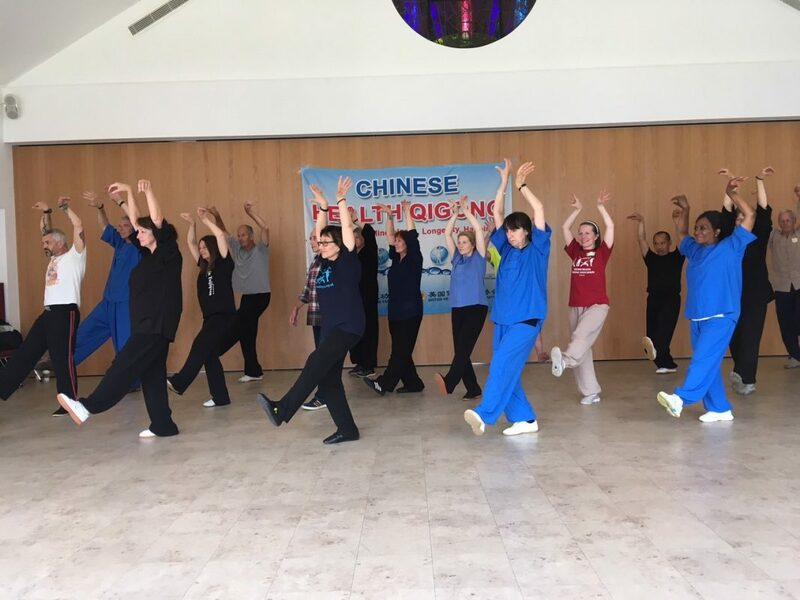 In addition to instructor courses you may be interested in the Health Qigong Games that are being hosted in the UK for the first time. Full details can be found here. And finally a huge thank you to Masters Faye and Tary Yip who work tirelessly to promote Tai Chi and Qigong. They are great role models to us all.